US-Syrian rapprochement seems to have hit an impasse. There has been no good news about the formation of a Lebanese government. Feltman recently stressed that the US has a problem with Syria’s continued support of Hizbullah. The US has not named an ambassador to Damascus, although it promised to do so some time ago. The Charge d’affairs has departed leaving the third in command to run things. The Saudis are also dangling the notion of an ambassador in front of Syria, but haven’t made the final arrangements to send one, just as they have not made arrangements for a meeting between the King and Assad, although there has been plenty of talk about a Syrian-Saudi confab. The Palestinian front remains as paralyzed as ever. Hamas and the PLO are far from agreeing to form a national unity government. Iraq security arrangements between Damascus and the US also appear to have stalled. The fact that a CENTCOM delegation preceded Mitchell to Damascus last month suggested that military cooperation would begin in tandem with the return of a US ambassador. The fact that no US ambassador has been named to Damascus suggests to me that Syria will likewise drag its feet on military cooperation. Finally, Israel has stonewalled US and Syrian attempts to get talks on the Golan back on track. Netanyahu’s insistence that Israel retain a major portion of the Golan and the Syria abandon its allies as a prerequisite to talks are both killers. Quite possibly, US policy makers believe that they can squeeze Syria to better their advantage now that Damascus’ two regional allies have run into headwinds at the polls. The Lebanese opposition lost elections in Lebanon and the Iranian government is in turmoil over its election misdeeds. Damascus is unlikely to to concede to last minute US bargaining tactics, however. It will likely stand firm, allowing Lebanon’s emulous factionalism to paralyze progress in forming a government. Assad can also stand back as Netanyahu and Obama play their game of chicken over settlements and the future of Palestinian land. If Obama blinks and allows Netanyahu to continue to expand Israel’s control over Palestinian land, as most expect him to do, it will be Saudi Arabia, Egypt and Jordan — America’s allies — which will take the most heat for America’s failure. They have gambled on Obama and the ability of the US to play a constructive role in the region. The Saudis have insisted that the Palestinians must pursue the path of non-violence, following the practices of Mahatma Gandhi and not those of Hamas and Hizbullah which advocate violent resistance. In the face of US pressure, Syria may have to remind the West that it also has cards to play. Perhaps that is the purpose of President Assad’s public hosting of Muqtada al-Sadr in Damascus? Damascus – Syrian President Bashar al-Assad urged Iraqi Shiite cleric Moqtada al-Sadr to press forward with Iraqi national reconciliation efforts in a Damascus meeting on Monday, Syria’s state news agency said. Al-Assad stressed ‘the importance of promoting national reconciliation among the Iraqi people and Syria’s keenness to support any effort aimed at achieving this goal for the sake of preserving the security and stability of Iraq,’ according to an official statement from the president’s office. The meeting sought to reinforce the ‘ties of brotherhood, friendship and common interests that bring together the peoples of both countries, Iraq and Syria, and to discuss the latest developments in the Iraqi arena,’ the statement said. Al-Sadr expressed his appreciation for Syria’s support ‘for the interests of the Iraqi people’ and for the unity of the country and its people, Syria’s state SANA news agency said. Joshua Landis, co-director of Middle East studies at the University of Oklahoma, saw a subtext to al-Assad’s hosting al-Sadr in Damascus. Earlier this month, US media reported that the Obama administration might soon appoint an ambassador to Damascus. Bush withdrew his ambassador to Syria in 2005, after the assassination of former Lebanese prime minister Rafik Hariri. Sheikh Ra’id al-Kazami, the head of al-Sadr’s office in Damascus, earlier told the German Press Agency dpa that the cleric, who maintains a broad following – particularly among poor, Iraqi Shiite Muslims – would discuss ‘the situation in Iraq after the withdrawal of US soldiers from Iraqi cities’ at the end of June. However things may turn out, Mahmoud Ahmadinejad comes back to the global scene with a lame-duck presidency …… there is a domino effect of Ahmadinejad’s weakened second-term presidency in the region. Syria’s position in its immediate regional context is seriously compromised. The rushed and injudicious siding of Hezbollah’s Hassan Nasrallah with Ahmadinejad has wedded the fate of the Lebanese group with that of the discredited Iranian president. Hamas would now be more inclined to strike a deal with Fatah and join President Obama’s renewed peace process. And the Mahdi Army now has to fend for itself in more pronouncedly Iraqi (even nationalist) terms, making easier for the U.S. military to leave. The domino effect, however, is not limited to the allies of the Islamic Republic …. ….Everything seems to be interconnected in the structure Obama is building. The rationale seems to be that all parties must do what is demanded of them according to a strict timetable…. … the US and Saudi Arabia are prodding Syrian President Bashar al-Assad to re-delineate his western frontier with Lebanon in order to allow for an Israeli withdrawal from the Sheba Farms area that straddles the border between Lebanon and the Israeli-occupied Syrian Golan. Should that obstacle be removed, and Israel indeed withdraw from Sheba, that would further undermine Hezbollah’s raison d’etre and argument that it cannot disarm, and must continue the armed resistance against Israel. Even more significantly, Syria appears to be acquiescing in the US call (through Egypt) for it to encourage the process of internal Palestinian reconciliation. Reliable reports from Damascus suggest that Syria has already begun blocking funds that were previously earmarked for the Palestinian group Islamic Jihad. The radical group is already under pressure from Hamas not to resume the shelling of Israeli towns and villages near the Gaza border, and to align more closely with Hamas. Everything seems to be interconnected in the structure Obama is building. The rationale seems to be that all parties must do what is demanded of them according to a strict timetable. Without Syria there can be no Palestinian reconciliation, without which there will be no Palestinian unity government, without which the Palestinian leadership would have a hard time making concessions and the Arabs remain aloof, without which Netanyahu would feel he could brush off the US demand on settlements. Obama is banking on the peace machine moving into high gear as soon as all the interlocking wheels are in place, and as soon as all the parties have understood the potency of his moral dictate about all sides needing to come to terms with the needs of the other side…. Israeli Middle East analyst Zvi Barel says that “Obama – rightly from his perspective – is trying to steer clear of a comprehensive plan with a specific timetable. But this is a dangerous gamble. There are too many reciprocal processes, too many loopholes, too many landmines.” …. “Mitchell says [the claim] is an utter fabrication,” a State Department official told Foreign Policy on behalf of Mitchell Monday. “Mitchell said, ‘I have never experienced the thought, let alone expressed it.'”…. Chatter that Mitchell may not be around in the job for long could be seen as a way to embolden those in Israel and abroad who think Israel should buck the Obama administration’s call for a settlement freeze. Turkish Prime Minister Recep Tayyip Erdogan will travel to Syria on Wednesday for a surprise trip, with the Turkish press speculating that reviving talks between Israel and Syria will be the most important item on the agenda. Syrian President Bashar Assad shakes hands with Turkish Prime Minister Recep Tayyip Erdogan in Damascus last year. Erdogan, who was last in Syria in December, will be accompanied on his one-day visit by his foreign minister, Ahmet Davutoglu. Israeli officials had no comment on the visit. Sabah, a daily paper considered close to the Turkish government, speculated that the visit had something to do with the recent visit to Damascus by Fred Hof, in charge of the Lebanese and Syrian portfolio inside the office of US Middle East envoy George Mitchell…. The United States views East Jerusalem as no different than an illegal West Bank outpost with regard to its demand for a freeze on settlement construction, American sources have informed both Israel and the Palestinian Authority. 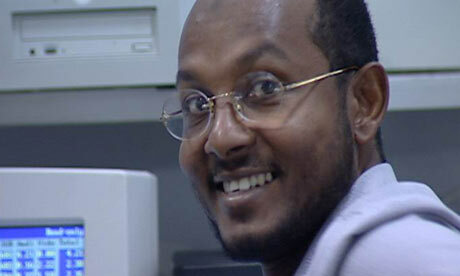 Sami al-Haj – freed in May 2008 after more than six years – to launch legal action against former US president. Following modernization, the Russian naval maintenance site in Tartus will become fully-operational,” he added. “The base in Tartus will provide all necessary support for the Russian warships which will be engaged in protecting commercial shipping around the Horn of Africa,” the official said. According to the Russian Navy, the naval base in Syria significantly boosts Russia’s operational capability in the region because the warships based there are capable of reaching the Red Sea through the Suez Canal and the Atlantic through the Strait of Gibraltar in a matter of days. Col. Gen. Anatoly Nogovitsyn, the deputy chief of the General Staff of the Russian Armed Forces, said in January that the General Staff had backed the Navy command’s proposal to develop naval infrastructure outside Russia. B) Hamas had a weapon storage in the building. The boss of the clinic said they had not seen Hamas troops in the building and there was a big white cross on the roof of the building as a mark of the clinic. IDF has asthonishing effective intelligence resources. They know about secret invisible weapon storages but do not know about very visible clinics. Well one has really use intensively 6 months for rehearsing in order being able to give such a stupid explanation with a straight face. The most difficult job in IDF is nowadays to be a spokesperson. Take a look at the beginnings of most of you sentences and statements. Do you see a pattern? 1.) Syria (via your pro-government POV) has no ACTIVE role in the peace process. Syria, as a habit, always points outward (Chris, you’re right on). 2.) The actors in the peace process have to please Syria and Assad. 3.) Conversely, Assad doesn’t have to do anything to please any of the other players. US-Syrian rapprochement seems to have hit a rough patch. There has been no good news about the formation of a Lebanese government. This is the type of alliances that Syria has ;that makes Israel stay on their grounds with no comprimise on the strategic Golan….Like I said before most Israelis are looking for a sign that Assad really is for peace and not Iran’s fanatical cleric’s side! It would seem from Josh’s analysis that Syria is only able to react to other’s actions. It has is a result of others’ actions that no progress has occurred in the peace process. It would seem, from reading that analysis above, that Syrian policy makers lack human agency. What has Syria failed to do to improve the prospects for peace? Dr. Landis’s “The Obama Peace Engine Splutters”. In any given endeavour that requires interaction between more than one party each has the right to determine whether 2+2 actually equals 4. From all indications the US policy towards Syria is still afflicted with Netanyahu’s 1990s prohect: A Clean Break: A New Strategy for Securing the Realm, commonly referred to as the “Clean Break” report, which was prepared in 1996 by a study group led by Richard Perle for Benjamin Netanyahu, the then-Prime Minister of Israel. The report explained a new approach to solving Israel’s security problems in the Middle East with an emphasis on “Western values”. At the present the military crusade into Iraq is costing the US. $260 million dollars a day and the Afghanistan/Taliban crusade is estimated to be around $70 million dollars a day with increasing casualties. It behooves any practical/intelligent “foreign policy” exercise to consider the cost benefit of any change in policy. If the US will not or cannot change its policy towards Syria (after determinig cost benefits) its almost infantile to expect Syria to modify its policies without any specific benefits. In the case of Syria what ever the costs are they have been in effect for years. If Mr. Obama is not any more forceful in making Mr. Netanyahu comply with international law why should Mr. Assad be forced to comply with demands that do not benefit him or Syria one iota? Syria failed to accept to be an Israeli American puppet and it will continue to fail to accept to be a puppet. President Obama seems to be not against the idea of Syria as a solid ally and friend rather than a Jordan-like puppet. But some of your “friends of Israel” in addition to friends of some Lebanese warlord (Geagea) who successfully promote their ideology as defense of democracy in Lebanon, in Washington are doing their best to make sure Syria is not seen a respectable or worthy ally. We’ll see who will eventually win … no hurry. The notion that al-Sadr is a Syrian ‘card’ is rediculous. Professor Landis, are you suggesting that Asad has some degree of control over the actions of al-Sadr? From earlier posts, it seems that you or Prof. Josh and the government of Syria want the Golan “on a Silver Platter”. Then we have Professor Josh bemoaning all the difficulties the other neighbors are having, Obama, Israel, Lebanon, etc and Professor Josh ends his post (above) by stating, “In the face of US pressure, Syria may have to remind the West that it also has cards to play”. For crying out loud Alex, WTF does Syria plan to give up for peace? This has got to be the most eye-opening set of threads I’ve seen here in a long time. Syria is going to get the Golan and give up nothing? Really? Tell us what the difference is? How is Jordan NOT a “solid ally” of the US? How is Jordan like a “puppet”? What will Syria get from the US that Jordan did not get? IMHO, those moderate Arab states that have made peace with Israel, are treated as respectable, worthy and solid allies. Feel free to detail what you’re concerned about. Speak to Shai about that. He’s keeping tabs on that. What I do not understand what is your stand Mr. Landis on the issues you are talking about? If Assad Syria met with the devil you just mention that he met the devil and used him as a card just to show he is not out of cards. If he met with the angle you said state the obvious, is there a difference between using the devil card and the angle card or it does not matter as long as he is finding any card to use. Does he represent Syria this way or himself? Even if he used the Sader Card, is Sader really in his hand or he has no influence on him. Can Assad ask Sader to make a move against the Americans or this is not possible. Does it matter if he offended the government of Iraq or the Sunni in Iraq or it doesn’t, you do not talk about these matters, it seems that is a trivial issue for politics in your opinion, but I do not think so. Does he in these moves represent the consensus in his party and his people or they gave him carte blanche to do what ever he sees right? I can only guess that it is some sort of (desperate?) payback for what Abbas has been doing to undermine Hamas in the territories or the unlikely attempt of coup within Fateh. I am not sure how much can this damage Abbas & co, i guess it really depends on what type of evidence they have. But audio tapes can be easily discredited and if there is more convincing evidence i am sure a backdoor deal would be made long before it could ever reach the public. That said, as the author of the Khaleej Times article states, negative public perception could very well be bad enough. Why should Syria give up something for … peace? Think about it … Is peace a reward that Israel is planning to offer to Syria? … is Israel a bully who is offering an end of its violence and terror in the region PROVIDED THAT SYRIA PAYS A PRICE? What is that price exactly? … money? .. no. 2) Israel returning all of the Golan .. but with many conditions that make it meaningless. 3) Placing conditions on Syria’s role in the region that make Syria another Jordan .. a weak subordinate to Israeli wishes and red lines. 1) Israel, after refusing to abide by tens of UN resolutions, should be rewarded for its violence and occupation… why? because Israel is a powerful country militarily? 2) To be a friend and ally of the United States, Syria must accept to be a non-player in the region. Peace can only be meaningful among equals … if Israel does not believe in Syria’s relevance … simply because Israeli air force can destroy Syria’s, or because Israel has hundreds of nuclear weapons and Syria does not, then there will be no peace. Not because Syria will not sign, but because this is not how peace is achieved. When Israel and its friends in Washington understand that Syria must be allowed to act as the Arab counterweight to Israel in the Levant, then they will hear from Syria about the many things Syria can do after there is peace … not as preconditions, but as part of the common interests shared by Syria, Israel, the United States, and the people of the region. Thank you for expressing your feelings, but if it is not too much trouble, I’d like you to answer the specific questions I asked in my last post to you. Try. It’s not that hard. Then, I would have more to go by. It is difficult getting rid of innate feelings of superiority. When someone has accepted and adopted GWB’s division of the world into us-versus-them, into Free Nations-versus-Axis-of-Evil, then you can’t expect this person to consider Syria as equal to Israel. In fact, it quickly becomes evident that the ONLY way for peace to occur, is for the weaker party to capitulate before the stronger one. There is no active seeking for common ground, but rather for one’s own higher-ground. For otherwise, how can one explain to himself the blind support given for the failed 8-year administration? Try answering the question I asked you – it can’t be so hard. As for comparison with Jordan: Sorry to tell you that Jordan is not a respectable, genuinely sovereign country. Is Israel willing to be a Jordan-like US ally? .. if Israel is willing to be that ineffective then I will be happy to promote the same future for Syria. Syria had a historic role in the region that it wants to regain … not for the fun and prestige of it, but for the necessity of it. Because for now we have a strong Israel, Saudi Arabia, and Iran … the Jewish, Sunni, and Shia powers. We need a strong secular state in the middle of the three of you … and that is Syria. Syria is willing to work effectively (like it usually does in the region) to fight religious extremism .. fight it non violently, through its own success as a secular state. With the Untied States on Syria’s side (and against anyone else) the Middle East will be a much more functional place… everyone, including Israel, will benefit from stability, security, trade, tourism, and openness. Is this good enough for you or do you prefer the joy of knowing that Israel is the only uncontested mini super-power in the region? 1) Syria has already lost the war with Israel. Militarily, economically and diplomatically. If you are not convinced, I can give you a few metrics that will show how bad we lost. 2) Syria is far from being a secular haven. It is a highly sectarian regime, in the same way that Saddam’s Iraq was. The fact that it is dressed up in Arabist Socialist drab does not hide its sectarian nature from anybody. I know that some will label me as a defeatist, but I think the remedy starts with a correct diagnosis. Until we recognize where are, we can not move to where we want to be. No one will label you anything. I’m sure you have reasonable metrics that will show how bad we lost, but I have my own that show we lost some and we won many. This is not a scientific process… the first thing we will disagree over is the weight you or I give to each component in the equation. There is sufficient evidence that Syria did not “lose” … after years of attempts to isolate Syria by the the Reagan and GWB administrations, Damascus again regains its role. Being on the defensive for few years does not mean Syria lost anything permanently. Is Syria secular? … it is more secular than most, and it has what it takes to be the leading secular state in the region. Again, I am quite confident it will be. How is Jordan not respectable? How is Jordan not sovereign? Is Israel willing to be a Jordan-like US ally? In what way is Israel NOT “Jordan-like” whatever that means? …if Israel is willing to be that ineffective then I will be happy to promote the same future for Syria. How will you know when Syria regains its “prestige”? Why is this necessary? Doesn’t Syria already have “prestige”? OK, so it seems now we need a “strong Syria”. Do you mean militarily strong? I think if Syria falls into the “peace camp” the US will definately support Syria economically, militarily, and diplomatically. But if Syria wants to “hang out” with all the beaus on the street, the US will not put all her eggs in one basket. That is why the details have to come out. What exactly does Syria want, and what are they prepared to give up? Syria is willing to work effectively (like it usually does in the region) to fight religious extremism .. fight it non violently, through its own success as a secular state. IMHO, this is speaking out of both sides of Syria’s mouth. Syria fights Islamic extremism by harsh military and security measures, but encourages the most extreme jihadists like Iran and their puppets Hezbollah and Hamas. That isn’t the “effectiveness” the US wants. The US wants Syria to jump the jihadist ship altogether. With the Untied States on Syria’s side (and against anyone else) the Middle East will be a much more functional place… everyone, including Israel, will benefit from stability, security, trade, tourism, and openness. I agree, but I’m not sure what “and against everyone else means”. I think Syria can offer much stability if we can trust Syria. We have too many bad experiences with terrorist supporters who say one thing and do another. If Israel is ready to make peace with all her neighbors, she is no “superpower”. While I agree that we have won some battles, and that some years are better than others. But if you look at the declared objectives of Syria since the Assads took power, they have all been lost. In particular vis-a-vis Israel. Secularism in Syria is exactly like secularism in Saddam’s Iraq. Do you still maintain that Saddam has contributed to making Iraq more secular? If not, what is the difference between Syrian Baath and Iraqi Baath in that domain? Both have oppressed the religious majorities in their country. Both used the language of secularism while practicing extreme sectarianism. If you want to see the real impact of the Assads on Syrian secularism, look at Iraq, this is the future they are leading us into. Iraqi sectarian problems are not the creation of Donald Rumsfeld and Paul Bremer, they have been bred by decades of Baath oppression. As a final note, I find it quite remarkable that we think that Syria is a leading light in secularism, when their principle allies are the Party of God, the Islamic Republic and the Islamic Resistance Movement. Exactly. See, Arab and Jew can agree on reality. The main issue in the latest UN report on human development is corruption in most Arab States, terrible public school which contribute to literacy in everything. The second issue is the uncontrolled population growth. There is a great frustration between Arab educated and they feel that they left out. Arab spring for social reform has unfortunately failed because reformers identified with the US. Totalitarian regimes circle and tackled that spring effectively and Arab countries lost human development battle. Arab countries have dynamic young population but in this current situation of dictators and authoritarians regimes Arab world are going no where, they are going in circles, or standing still. Hope is disappearing gradually from Arab World for change or for better future. Young people alienated, they think they have no future and they blame their leaders rightly but they don’t know what to do about. Young generation is trapped fearing from Islamist from take over and they fear their government, so they feel entrapped. Lack of democracy is for sure encouraging extremists and that is what is going on in the Arab World. In MHO, peace or no peace nothing is going to change except for the worse. Message to AP, it seems occupied territories doing better than Syria on most indexes, and that is something unfortunately I should admit to you (don’t think of it as good please) is a plus comparing with the Syria’s. Admissions are good. They’re cathartic. Meanwhile, well educated Arabs don’t bother me. The more open-minded and educated the person, usually the more tolerant they become. But getting back to Syria, I’m just wondering if peace is ever achieved, what will distinguish Syria from Eygpt in terms of democracy, dislike of the ruling regime and an open society? Most westerners see peace with Syria as a propping-up of a leader just like Mubarak, King Hussein, Qadafi, etc. Is that what the Arabs really want? AP, it does not matter with whom you are going to make peace, because peace is a necessity for all times and for all people. What will distinguish Syria from other state is a big thing here; Syria and the Baath party is the last bastion of anti peace with Israel, getting it on board change the dynamic of the problem. I think educated Syrians will applaud the peace even if it was through the dictator. What Arab wants is a dilemma but removing one obstacle could open another can of worms, may be for their benefit and lets say the region benefit, or else, who knows? A girl plays with Syrian Arab Red Crescent volunteers who are trained to assess cases of children who need special psycho-social support. DAMASCUS, Syrian Arab Republic, 22 July 2009 – Six-year-old Tareq* clings to his mother’s clothing and waits anxiously for his weekly psychotherapy session. The social worker, the psychologist and Tareq’s mother all encourage the little boy to lift his head up and say hello, but he won’t leave his mother’s lap. Ali is another six-year-old visiting this Child Protection and Psychosocial Support Unit at a child-friendly space operated by UNICEF and the Syrian Arab Red Crescent (SARC). It is one of the many centres run by SARC volunteers, who organize games and activities for Iraqi refugee children. Ali’s family fled Iraq three years ago, shortly after the child witnessed a group of men killing his uncle. For a month after the event, Ali sat in a corner crying and spoke to no one. He developed very strong fears – of the dark, of the sound of shooting, of sleeping alone and even of going to the bathroom. At the child-friendly space, activities help identify children in need of psychological assessment. “We watch the relationships kids have with their peers and the volunteers. Some children may be violent and aggressive; others refuse to participate in group activities,” says volunteer Sarah Jamal. A girl playing in the UNICEF/SARC child-friendly space outside Damascus. Ali’s mother believes he has made progress. “Although his fears are still very much present, he can now control his voice [and] does not scream for no reason,” she says. After his appointment with the therapist, Tareq returns to the waiting room more willing to talk. He speaks about his favourite singers and games. Tareq’s mother says her family was constantly on the move before their arrival in the Syrian Arab Republic because her husband received death threats. “All of my children have witnessed the worst side of war,” she recalls. Her husband recently returned to Iraq to try to replenish the family’s finances. He has not been heard from since his departure. Ultimately, children’s mental health is very much influenced by their parents’ and other family members’ mental state. “A child learns everything about the world from his parents. If the mother feels that the world is not a safe place, she will pass on her fears and sense of insecurity to her children,” explains a case worker at the centre, Yasser Moalla. UNICEF and SARC have been establishing multidisciplinary units since April 2008 to support Iraqi children and family members in need of specialized assistance. Each unit consists of a psychiatrist, a psychologist, a speech therapist, a case study worker and a social worker. To date, the units in Saida Zainab, Jaramana, Mezzeh and Mazraa have received more than 1,600 cases and have provided more than 3,500 follow-up sessions. * The names of the children in this story have been changed. Because of your note: “it seems occupied territories doing better than Syria on most indexes” For the last 3 hours I went through the report you linked page by page from page one to 288 in details, and I went through all the data and schedules there and with all due respect your note is INCORRECT, OPL was not better (not even slightly) than Syria on almost ALL the indexes, there was couple of categories where OPL got higher percentages and number than not only Syria but most of the Arab countries but that was only because of the way the study was conduct and the questions of the survey that been asked, specifically on human resources and that is not because of the lovely Israeli occupation nor because of the ‘wise’ Palestinian authorities, it is purely because of the high density of population in a small urban areas and the fact that there is no real political power other than the ugly face of the Israeli occupation AP keep defending. On top of that, most of the data from the OPL are missing and not available so the comparison is not quite applicable between a free country like Syria and one part of Palestine since they didn’t include Gaza strip in the Data. I just wanted to clarify that especially when we want to be reasonable as men of science and numbers. It’s been 60 years and Israel is still under siege. Hitler did capitulate despite his thoughts that germans were a chosen race. South Africa apartheid collapsed, India became independent, Vietcong won Vietnam, there are many examples in history where the ‘military and technologically weaker” won their freedom. Israelis may think they are the chosen race and that they are powerful but their despise for international laws and the gradual lowering of their human values are maybe sign of a general decline within the society of the moral values that lead the jews through their hard history. When you have corrupted leaders like Olmert and many others that are not yet scrutinized, when you easily can forget Kana, Gaza then you should wonder where your country is going within itself and how strong is still is. Akbar have you really an authorization of speaking in the name of “most westerns” if by westerns are meant the people of EU and USA? Some pro-Israelis and extreme Jews in Israel are not “most westerns”. Most westerns are not so naive as you seem to believe that they would see the regime type of Syria as an obstacle towards peace. Most westerns, Arabs and others would like to see peace in the region and Israel back on the 1967 borders. Israeli Jews surely seem not to like that to happen. Akbar Finland made peace with dictator Stalin twice. Was that made to prop up Soviet communism? Your “most westerns” theory is also contradicted with the polls. In the year 2003 59 percent of Europeans did see Israel as danger to global stability and that Israel presents a danger to world peace. And that was before the Lebanon and Gaza events. Now I suppose the figures would be even less flattering for Israel if such a poll would be made today. I must say when I read the news from the region’s “the only democracy in Middle East” really doesn’t look good for democracy. Akbar I do not think westerns would like to see more democracies like Israel to emerge in Middle East or anywhere else. Self-autonomy with Jewish settlers. Amusing. Last year, Israel’s Vice Prime Minister Shaul Mofaz offered an unequivocal veto on a key issue in the Middle East peace process. Any return of the Golan Heights to Syria would result in an “Iranian foothold” on Israel’s border and would thus not only be politically naïve but irrational. Well do you Israelis really think that Syria donates Golan to Iran after getting it back? Or how this Shaul Mofaz’s new excuse should be seen. I must say that it never stops to amassing me the large variety of Israeli and pro-Israeli reasons why peace is not possible which are expressed. Hmmmmm democracy, dictatorship, settlers, terrorism. I agree with every word. I wish more of my fellow countrymen could understand this. Peace will finally put the people of this region to the real test – the test of freedom. Do they want to continue living in chiefdoms, in kingdoms, in undemocratic regimes, or are they ready to join the “Free World”, by removing despots (peacefully, hopefully) and holding real democratic elections. Ironically enough, it was the people without a nation, the Palestinian people, that received the first opportunity in the Arab world to hold such free democratic elections. Unfortunately, the most important bodies to recognize the results, besides the Palestinians themselves, rejected them. But there’s no doubt, that once the state of war with Israel officially ends, leaders will no longer be able to use this “excuse”. And I’m not only referring to Arab leaders, but in fact for Israeli leaders as well. The entire people of this region, Jews and Arabs, have been held hostage for decades because of this war. It is time we remove this “excuse”, once and for all. As for the Palestinian Territories, and whatever ranking they received in comparison to Syria. I can speak for Gaza, which I’ve seen unfortunately as a soldier too often in the late 80’s and early 90’s. And from what I know of today, it has only worsened. Trustquest, Gaza is the closest thing on earth to a living-Hell. You cannot imagine the filth, the lack of the most basic sanitation, the poverty level, the never-ending misery. I cannot imagine another place on earth (with the exception, maybe, of Rwanda or Darfour) that is more miserable. The average Gazan is not thinking “human rights”, he’s thinking “food and water”. The average family has no heating, and receives one warm meal per day. I wonder if any of the pro-Operation Cast Lead commentators here (Akbar, this means you) would be willing to change places with a Gazan family for a week. Or even for a day. I thought you didn’t like us “peace camp” members… 🙂 Or is the “peace camp” you have in mind, when it comes to Syria, is really the “capitulators camp”? To remind you, the United States sided for years with all sorts of undemocratic regimes and leaders to whom human-rights is a village in Northern Siberia. Iraq under Saddam, Iran under the Shah, China under all its leaders, to name just a few. Iran has a German and a Swiss embassy. Yet I don’t see the United States threatening either Germany or Switzerland with economic sanctions, or cutting diplomatic relations with the two. Syria has a right to have ties with any nation is chooses. Obviously, if it will help Iran transfer weapons to Hezbollah via its territory, it will not have peace with Israel. But it is highly unlikely that once there IS peace, Syria would STILL continue supporting Israel’s enemies militarily. I don’t believe you can find a counterexample to this. We made peace with Egypt and Jordan, and neither has acted towards Israel as it did beforehand. I think educated Syrians will applaud the peace even if it was through the dictator. Thanks. That’s the sort of answer I was looking for. I have no idea what Syrians are thinking and so that is why I asked. Because of your note: “it seems occupied territories doing better than Syria on most indexes” For the last 3 hours I went through the report you linked …. there is no real political power other than the ugly face of the Israeli occupation AP keep defending. I did n’t read the report Truthquest posted, and I assumed his description was factual. Also, I didn’t know if he meant Israeli territory or Palestinian territory. Education in PA controlled territory would be the responsibility of the PA. Yes, I defend Israel in most cases. Sorry. Akbar have you really an authorization of speaking in the name of “most westerns” if by westerns are meant the people of EU and USA? No, I only speak for myself. That being said, the US and the West have supported plenty of dictators, and I’m sure Assad would be no different. Akbar I do not think westerns would like to see more democracies like Israel to emerge in Middle East or anywhere else. Now you’re sounding like an authority. Which type of democracy would “westerns” like to see? Well do you Israelis really think that Syria donates Golan to Iran after getting it back? Considering Iranian and Syrian support of Islamic fundamentalism and militant groups such Hamas and Hezbollah, it is MHO that Mofaz’s concerns are well founded. Yes, I also remember the UAR. Those were tough times. I don’t know Shai, but I think this link is a good description. I bet you have more questions. Right? المتفائل في الحياة يرى نصف الكأس مملوءاً، والمتشائم يرى الكأس نفسه نصفه فارغاً، ومن يبتعد عن وطنه مدة طويلة من الزمن ويعش في عالم أكثر تقدماً ورقياً في مختلف جوانب الحياة يعتد أن يقيس أمور الدنيا والحياة بمقياس عال في السقف والدرجة ما يرمي نتائج الرؤية في قاع المراتب، ويغلف الأحكام والاستنتاجات النهائية لواقع الأمور على الأرض بغطاء المطلق، وهذا ما يدفع به لتصديق قشور التكبير والتعظيم الإعلامي لأصغر الأمور. منذ خروجي من الوطن الحبيب سورية في أوائل عام 1981، وأنا أتّبع تلك القاعدة للنظر في أمور الحياة والشأن العام، وكنت أظن (مخطئاً) أن ما وصلت إليه دولة عظمى مثل الولايات المتحدة الأميركية من رقي وعظمة في نظام الحياة مجتمعة يجب أن يكون المقياس الرئيس للمقارنة مع حال مجتمعنا العربي والإسلامي، ناسياً أو بالأحرى متناسياً أن لكل حضارة ظروفاً تاريخية وسياسية واجتماعية وثقافية تدفعها نحو رسم حاضرها ومستقبلها وتحثها على خلق نظام يتناسب مع أعرافها وتقاليدها ويحترم تاريخها. خلال رحلتي القصيرة في العمل السياسي المعارض في الخارج، قرأت الكثير عن مطالب المعارضة السورية التي يمكن تلخيصها في المطلب الرئيس وهي الديمقراطية في الحكم والتعددية السياسية. وطبعاً ما يتبع ذلك الوضع من حرية في التعبير والرأي وضمانة حقوق الإنسان تحت غطاء القضاء المستقل واحترام الدستور وسيادة القانون. ومن يقرأ ما يكتبه البعض من أعضاء تلك المعارضة في الإعلام يظن أن سورية تئن تحت وطأة الاستبداد والسلطوية لدرجة من الاختناق تكاد تلغي جميع جوانب الحياة السياسية وهذا بالطبع إجحاف في الوصف لحقيقة الأمور. تعودت المعارضة السورية أن ترى الأشياء بألوانها المطلقة إما أن تكون سوداء قاتمة وإما بيضاء ناصعة، ونسيت أو بالأحرى تناست أن هناك أطيافاً متعددة الألوان تفصل بين الطرفين، وأن الحقيقة تكمن بينهما. فما بين المطلب الرئيس للمعارضة السورية في الديمقراطية بالحكم في سورية والتطبيق الفعلي له على الأرض، مسافات واسعة من الزمن يشغلها الإصلاح والتغيير لنظام حكم يعمل في الوقت نفسه على استيعاب متطلبات العصر والعالم وتوفير الأمن والسلام لشعبه دون أن يخلق هزة أرضية سياسية واجتماعية تذهب به وبالوطن إلى ظلمات الانشقاق والتمزق الوطني والحروب الأهلية والخراب المستأصل بما يحوطه من أقطار عربية. لقد عانت سورية في السنوات الأخيرة من ضغوط سياسية إقليمية ودولية كادت تضعها في دوامة الحروب الإقليمية والأهلية التي تعصف بالمنطقة، ولكن توافق الموقف بين الشعب والسلطة عزز الوحدة الوطنية وأعطى الثقة للقيادة بالاستمرار بتلك السياسة الحكيمة التي أثبتت وتثبت اليوم أنها كانت وما تزال على صواب في الرؤية المستقبلية والإستراتيجية للوطن والمنطقة كلها. فاليوم تتمتع سورية بموقع أقوى مما كانت عليه منذ خمس سنوات، وأكثر انفتاحاً لها في الخيارات الاستراتيجية. فمنذ انتخاب الرئيس الأميركي باراك أوباما، وتغير سياسة الولايات المتحدة في المنطقة عن الإدارة السابقة من سياسة الخيار العسكري أولاً إلى الحوار والدبلوماسية، أصبحت سورية في مركز متقدم يدفعها نحو قيادة عملية السلام في الشرق الأوسط ونحو الإطار القومي العربي. كنت قد أشرت في مقالة سابقة إلى أن سورية بلا شك تمر في مرحلة من التجديد والتغيير المستمر منذ سنوات، ومن يعود إليها من أبناء الوطن في زيارة من الخارج بعد غياب طويل لابد له من أن يلحظ تماسك وتطابق الموقف الوطني بين السلطة والشعب. وعلى الرغم مما تروّجه وسائل الإعلام المعادية للموقف القومي العربي تجاه القضية الفلسطينية والأراضي المحتلة لابد للمشاهد على الأرض أن يلمس الدعم الشعبي الحقيقي للمقاومة ضد مشروع الاستيطان والاحتلال الإسرائيلي للأراضي العربية المحتلة. أما على الصعيد الداخلي فمن غير الممكن أن يخفى على الزائر مدى الحب والإعجاب الشعبي الذي يتمتع به سيادة الرئيس بشار الأسد في الشارع السوري والعربي، وهذا ما يدفع المشاهد على الأرض لأن يتساءل عن مدى مصداقية ما يُكتب ويُنشر في صفحات ومواقع الإنترنت للمعارضة السورية في الخارج. لا يمكننا التخلي عن التغيير والتجديد والمطلب الديمقراطي في الحكم في سورية، فهذه هي الضمانة المستقبلية والتركة الوحيدة التي تضمن الأمن والسلام للأجيال القادمة، وما تتمتع به سورية اليوم من مثال التعايش بين الطوائف والتوافق في الموقف الوطني بين السلطة والشعب يجب أن يكون الحافز الرئيس لتبني قيم التقدم والمدنية للوصول إلى تلك الأهداف النبيلة. ولكن علينا أولاً أن نثق بقيادتنا الحكيمة لأنها تعمل من أجل بناء هذا الوطن، ونسهم بكل إمكانياتنا في العمل إيجابياً في هذا البناء، فالوطن مُلك لأبنائه وأولاده الأبرار والمتفائل يرى الكأس نصفه ممتلئاً ويسعى ليملأ النصف الآخر. Well Akbar compare the calenders of FM Livni and FM Lieberman. Both Israeli FM’s visits abroad and foreign FMs visiting Israel. Then even you can understand the difference. Lieberman makes very few visits and few want to meet him compared to the time of the previous regime. You can also look at the body language of the foreign hosts when they let the press to photograph them. Lieberman smiles, the others not. Only professional trained “tv-star” politicians can smile when shaking hands with Lieberman. Well they would be able to smile even shaking hands with the gentleman leading the religious peoples’ underworld. 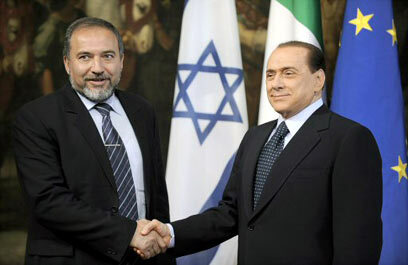 Even the clown Berlusconi doesn’t seem very relaxed with Avigdor. That might be not for reluctance for that what Lieberman presents, but because Lieberman is not a pretty “professional” woman. But I must say I support Lieberman being a FM. He and his buddies advance considerably the peace agreement’s timetable. Not because Lieberman and Bibi want that peace, but because the outside world understands so extreme Fascists must be tamed and fast. Lieberman is greatest diplomatic asset Palestinians ever have had. By the way Akbar will Lieberman be a Palestinian when Nokdim will soon be part of Palestine and if he decides to stay? Maybe he could even in future resurface as the foreign minister of a Hamas lead government. Opportunists are fast in their movements and the value of money knowing gentlemen are even faster. By the way Akbar will Lieberman be a Palestinian when Nokdim will soon be part of Palestine and if he decides to stay? That’s doubtful, because until now all agreements with the Palestinians have been predicated on the removal of all Jews from PA control. And so far, the Israeli fascist government has agreed. The rest remains to be seen. Right now Israel’s Hard Line™ PM has refused to consider evicting Jews from east Jerusalem. I think you make an interesting and thought provoking comparision between Iraq and Syria. I hope you are right and that we can transit from current situation to freedom while avoiding sectarian violence and civil war. It is clear that syrians are peace loving by nature, but the mechanics of the situation are very condusive to long sectarian conflicts in the future. One thing you have to understand about Syria is that the conflict with Israel is not about the Golan. It is about the deep injustice they feel Palestinians have suffered. The Golan was the price Syria paid in trying to rectify this injustice. Ordinary Syrians will not welcome peace, but they will accept it if it does give them some tangible benefit. While our dictators try to benefit from these feelings, the feelings themselves are real and ppredate any state propaganda. I do have another question. Is it FOX-ed that teaches you guys not to answer yourself, but to post Wikipedia links to “tough” questions? I want you to tell us all what Syria, Hamas, Hezbollah, Iran, little green Martians have to do to “recognize Israel”. Must they send us some written “recognition” (de jure, de facto, de emo)? Must they make some public statement? What would satisfy you, Akbar, since you’re so worried that we’re not being recognized? And please tell us whether you think Israel should do something to also “recognize” all the above mentioned parties? And how does it actually work, who recognizes whom first? Will Israel recognize Hamas only if Hamas recognizes Israel? Because you see Akbar, there are probably millions of Americans just like you, who are actually impressed by some FOX News statement like “Yeah Jim, and Hamas doesn’t even RECOGNIZE Israel!…” (nodding reporters in the background, nodding host in the studio, nodding audience at home, nodding GWB.) There’s an acronym youngsters use online for such useless manipulation of audience – it’s called “wtf”. Lieberman is greatest diplomatic asset Palestinians ever have had. The Golan was the price Syria paid in trying to rectify this injustice. Thanks. I will respectfully disagree about that. While I’m sure Syrians are very pro-Palestinian by nature, they’ve had their disagreements with the Palestinian leadership, including our dear friend Yassir. I tend to believe the Golan is a bit more important to Syrians and Assad than all the varied grievances the Palestinians have. I want you to tell us all what Syria, Hamas, Hezbollah, Iran, little green Martians have to do to “recognize Israel”. Syria, Hamas, Hezbollah, Iran, and the little green Martians should annul their charters seeking the destruction of Israel (aka “Zionist usurper”, etc) and state that they recognize the State of Israel. I suppose that would be a good starting point. Must they make some public statement? What would satisfy you, Akbar, since you’re so worried that we’re not being recognized? The above would satisfy me. Of course, talk is cheap. I would prefer if it were handled by a third party whereby a durable cease fire would ensue. But if peace is attained without any land transfer, that wouldn’t satisfy the Arabs. The whole schmear probably has to be handled in an “all encompassing” peace treaty. Recognizing Hamas and Hezbollah would be a heck of a lot easier if they recognized Israel. We went through this with the PLO. It isn’t impossible. But then there is the issue of who’s in charge: Fatah/Abbas or Hamas? WTF is a great abbreviation. And Fox News’ ratings are so high compared to the other news sources because people simply believe Fox more than the rest. Like you sort of said above, Hamas and Hezbollah are Israel’s “greatest diplomatic asset”. Jad, the OPT is slightly above the Syria in the schedule, HDI rank for OPT is 106 and for Syria 108. The difference does not mean occupation is better; it means that countries which are not under occupation should do better. Being slightly better does not mean that Palestinians will like it under occupation; Palestinians will fight occupation with their nails till eternity. It varies from table to table but the end results on the HDI is what I mentioned above. The Human Development index is based on too many factors mainly on the Levels of human security associated with good governance related to upholding the people rights to life, freedom and protection from aggression. It is based on acceptability of state of own citizens, compliance with human rights charters, expression of utilizing monopoly to force coercion and institutional check balance to prevent abuse of power. In short human security necessary for development is defined as the liberation of human being from those intense, extensive, prolonged and comprehensive threats to which their lives and freedom are vulnerable. is an essential condition for strengthening human security in the Arab countries. Thank you for clarifying, I did notice the HDI, this is why I went through the whole report. I agree with you that human security is the main and essential aspect for development, which I think Palestinian doesn’t have not under the corrupted PLO nor under the radicals Hamas and defiantly not under the Israeli disgusting occupation, however and with regard to this specific report I’m not convinced and I think that the report is built not on a sufficient data to come to its results and without any indication of the circumstances that surrounding those results therefore to conclude that OPT is higher than Syria for me personally is inconvincible and after I went through the whole document and as a scientist who believes in numbers and that every detail should be taken in the calculation and because they are comparing an entity that is under the Israeli occupation and living purely on charity while Syria and regardless of how corrupted the government is, it gets its own budget from what Syrians work hard to produce doesn’t make a good case for me to believe. Occupation is an ugly fact for Palestinians and not taking that in the equation or writing just couple pages in the report about that is laughable and giving the occupation credits for what they should be hold responsible for instead. …..As a Syrian and if I’m going to believe this report (BIG IF): I would have a problem giving the Palestinians any financial support whatsoever since according to the report they live better than me the Syrian, they got more money than me the Syrian and they have more opportunities and more security than me the Syrian, so why to help them? I’ll use my money with other needing Syrians and let the Palestinians living in the west bank and Gaza enjoy the report and the occupation. I was sitting with a Palestinians friend last week and he told me about his trip to OPT; he told about the disparity in income between Palestinians living in Jordan and OPT. According to him it is ten fold higher income in the OPT. If you look at their stock market and compare it with the Syrians you will get another idea about the difference in economy and how it is functioning even it is under occupation. Your approach to the report is not my type of approach, because what I’m interested is finding the cause of stagnation and then you can model a plan. The report have great diagnosis and touch on the region as a whole and no one can say I’m better than his brother except those couple of highly rich country who are using their wealth smartly and for the benefit of the their people and the region. The report did not cover the corruption issue very well, still long list of data are missing. Ones of the great destroyers to Syrians economy are those people who accumulated ten fold their country budget and deposited outside their country. They do not know how much their bank account and they do not know what to do with their money and if some of them do work in Syria they do safe work protected by the despot. This I think is the greatest predicament of the last 50 years in Syria, it is a system which can not find way out, I don’t think you want names do you? I totaly agree with you about the reason for Syria being in the back of the arab country while it should be on the top of that list without the corrupted, undemocratic and incredibly bad managed resources (Human and natural) this system does. You are also right that I’m not approaching the report from the same angle as you which is understandable. In regard of your friend’s comment, it actually prove my point, that Syrians should not give Palestinians any financial support since they have enough money (not their own since they got millions of dollars from everybody like the Israelis) while Syrians do not get those millions without working, and YES the corruption and mismanagement, the system and frankly us the Syrian individuals in a way or another are the main reason for that.